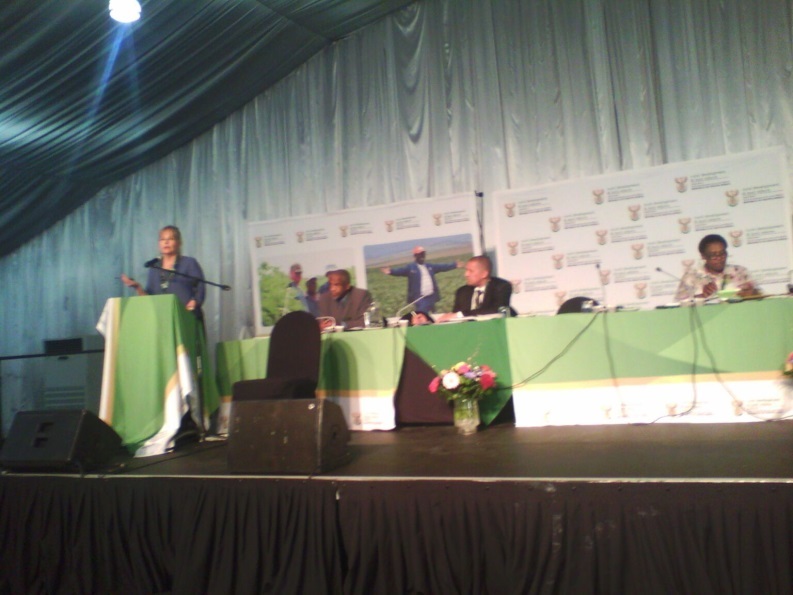 On the 4-6 September 2014, the Department of Rural Development and Land Reform (DRDLR) hosted the Land Tenure Summit. I joined the Communal Land Tenure session, which was attended by a large contingent of traditional leaders. The two presenters were Aninka Claasens from the Centre for Law and Society and Judge Ngwenya, the current chairperson of the Kwa-Zulu Natal Inghonyama Trust. 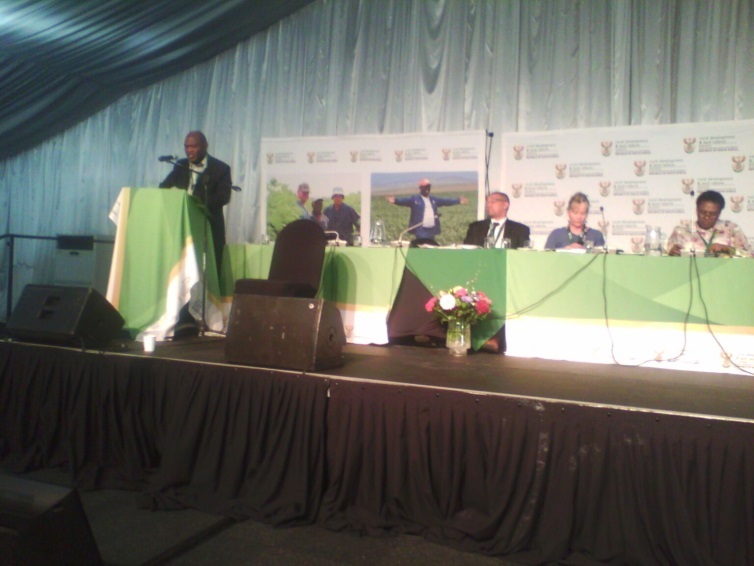 During the presentations, Judge Ngwenya argued that land title would be best registered under traditional councils, giving an example of Inghonyama Trust’s current administration of land for the benefit of rural communities in KZN. In contrast, Aninka Claasens argued that the Interim Protection of informal Land Rights Act 31 of 1996 (IPILRA) is the only hope for people in communal areas when their land rights are threatened, but that it needs to be upgraded. She argued that land rights would be best placed in the hands of households, instead of under traditional authorities as they were established during Apartheid. The audience was given an opportunity to debate the issue of the DRDLR’s Wagon Wheel proposal of land tenure; a proposal in which land ownership is based on “pre-colonial” models of ownership and access whereby the royal household is considered to have separate, independent land while sharing the remaining land with other households. The power of land allocation is vested in the hands of traditional leaders. The question was whether the Wagon Wheel would provide the solution to the current tenure insecurity and abuse of power by traditional leaders that people in communal areas are subjected to under informal land title. As a resident of a communal area and having been born and raised in a royal family, I was the first to comment. I have seen how land allocation was previously administered before the Apartheid system was imposed, and have experienced the abuse of power by current traditional leaders in the name of distorted customary law that has been adopted from the colonial and Apartheid eras. I am of the view that the Wagon Wheel proposal gives rights to royal households that they never had under customary law and tradition. Similar to what occurred under the colonial and Apartheid governments, the model will further distort living customary law and traditional leaders will be allowed to manage land as if it is their personal property. Land has always been the property of all households in a community who had joint and equal capacity to make decisions about regulating the land. It is not customary to treat the royal household in a superior way. Royal households have to remain equal to other households, as per the Constitution. It should also be taken into account that the Constitution only recognizes leadership and does not give any governance roles to traditional leaders (despite receiving salaries and other subsidies). Many practices that used to take place within communal areas have changed, to the extent that the role of traditional leaders would no longer operate exactly as before. The Minister has argued that royal households have traditionally had the responsibility of taking care of the needs of the poorest. If they have extra land, they will be able produce and feed the poorer households from that resource. However, the practice whereby people can approach the traditional leaders for safety, as well as get food when they are hungry, has no space in the current setup under which the traditional leader and the people live. Most traditional leaders are not currently residing in communities; they reside in townships and cities and the few who reside in communities are not easily accessible. Under the Wagon Wheel proposal, traditional councils and leaders are to hold the land title and administer it. During Apartheid and presently, administration of land in communal areas has been abused by traditional leaders. They sell land for their own benefit without consulting land rights holders and do not account to anyone. Most traditional leaders are illiterate, because once they know that they are going to be leaders, they stop attending school and wait to ascend the throne with little or no knowledge of traditional systems to deal with communal land issues. The Wagon Wheel is not an ordinary proposal; it needs to be implemented by people with particular skills that most current traditional leaders do not have. It would need a big budget to capacitate them to the level where they can make meaning out of it. I asked Judge Ngwenya to tell participants how the Inghonyama board members were chosen. My fear is that most trustees are nominated rather than elected into the position and that traditional leaders will appoint their relatives and friends. When he was given opportunity to respond to questions that audience members raised, he did not respond in respect of the question I specifically posed to him. My suspicion may be correct. During his presentation of how the Trust works, he said that the Wagon Wheel proposal mirrors the Trust’s administration. However, it became clear that community members are excluded in the allocation of land and discussions regarding any application for land access and use. If this method is to be followed, land rights holders will be bypassed and their plough fields and grazing land will be sold to outsiders without their consent. I observed that during the reporting session, the feedback did not include many of the debates and recommendations made by the audience. The Summit did not allow an opportunity for participants to choose their scribes and representatives. Instead, staff from the Department undertook these tasks. I will not be surprised if the Department of Rural Development and Land Reform approves the Wagon Wheel model, despite our criticisms and concerns.